Newcastle Airport along with BMI Regional have announced a new route from Newcastle to Brussels. The planes have 49 seats and will fly twice daily between the two cities. "We think this is a very important route for the region from the point of view of Brussels being a very important city. All of the EU functions are in Brussels, along with the members of the European Parliament. It isn't aimed completely at business though. 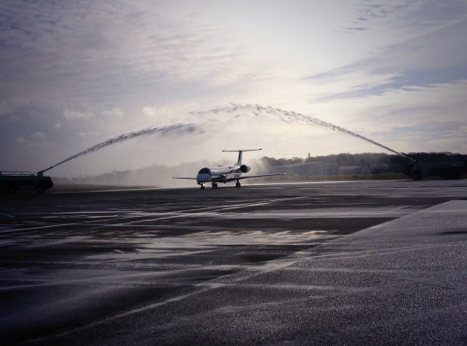 As the first flight touched down on Newcastle Airport's tarmac it was greeted by a water cannon guard of honour (see a video below), before the passengers got off and made their way into the terminal. "We're delighted to re-introduce the service between Newcastle and Brussels. It's an important route because it connects Newcastle with Brussels and beyond. So it's important for business and leisure. And it's not just people from Newcastle going to Belgium, but people from Belgium and worldwide connecting into Newcastle. It's targeted at business people with flights each day in the morning and evening, but it's also very convenient for leisure travellers as well."